From April 6th till May 6th 2016 the Floralia-Brussels flower exhibition can be visited. The Floralia-Brussels is a spring flower exhibition in the park and the greenhouses at the grounds of Castle of Groot-Bijgaarden. This year it will celebrate its 13th anniversary. 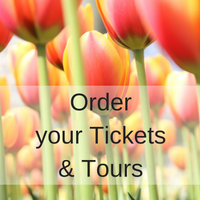 Visit the beautiful flower gardens Groot-Bijgaarden for an unforgettable flower experience. From 22 April through 1 May 2016, the city of Ghent in Belgium will be in bloom and entirely devoted to the 2016 Floralies (also known als Floralien). For ten days long, four iconic locations will form the backdrop for the loveliest creations.